Marie Faircloth Shelton; “Gee’ to her grandchildren, 93, passed away Tuesday evening at Kitty Askins Hospice in Goldsboro after a period of declining health. She was born October 28, 1925 in Sampson County, NC. The daughter of Henry and Clara Faircloth, she grew up on the family farm in Chatham County, NC. 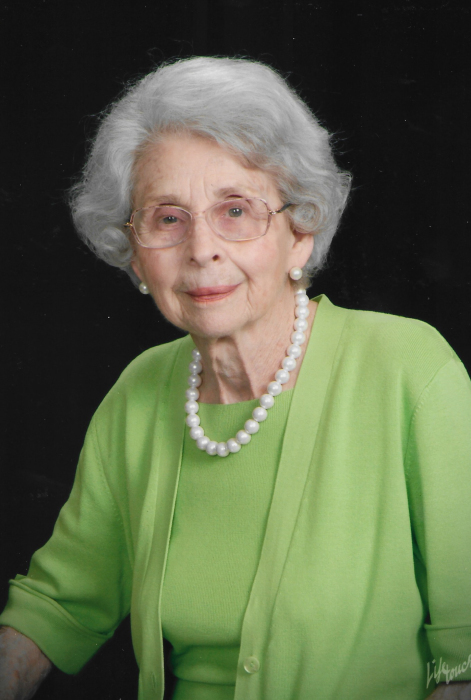 Marie graduated from Pittsboro High School in 1943 and attended Louisburg College. After college, she worked for a time in Chapel Hill, then later moved to Greensboro where she met her husband, Buck. They were married in 1954 and in 1955 they moved to Kinston due to Buck’s employment in the tobacco industry. Both Buck and Marie worked at Austin Carolina Tobacco Co where she was a bookkeeper for many years; retiring in 1991. She was a member of Queen St. United Methodist Church and the Frank Mock Sunday School Class for 63 years. In addition to her parents, Marie was preceded in death by her husband of 52 years, Buck Shelton and brother, Jim Faircloth. She is survived by her son Woody and wife Sue Shelton of Institute, NC; her sister, Ruby Rives of Greensboro, NC; grandson Hunter Shelton of Harrisburg, VA; granddaughter Catherine Pope and husband Dewitt of Hugo, NC; grandson Walker Shelton and wife Kayla of Farmville, NC; and caregiver Linda Jones. Funeral services will be held 11:00 a.m. Friday, March 22, 2019 at Queen Street United Methodist Church with Reverend Karl Grant and Reverend Bill Gattis. Interment will follow at Pinelawn Memorial Park. The family will receive friends and family at the home of her son Woody and wife Sue, 4873 Bryan Hardy Rd, La Grange, NC after 6 p.m. Thursday evening. Memorials can be made to Queen St. United Methodist Church c/o The Frank Mock Sunday School Class, 500 N. Queen St, Kinston, NC 28501.